Speed: 44+ knots (81+ km/h), max. The Independence-class design began life at Austal as a platform for a high-speed cruise ship. The principal requirements of that project were speed, stability and passenger comfort, and Austal's team determined that the trimaran hull form offered significant passenger comfort and stability advantages over both a catamaran and a monohull. The high-speed cruise ship project evolved into Austal's commercial high-speed trimaran ferry HSC Benchijigua Express. The standard ship's company is 40, although this can increase depending on the ship's role with mission-specific personnel. The habitability area with bunks is located under the bridge. The helm is controlled by joysticks instead of traditional steering wheels. Although the trimaran hull increases the total surface area, it is still able to reach sustainable speeds of about 50 knots (93 km/h; 58 mph), with a range of 10,000 nautical miles (19,000 km; 12,000 mi). Austal claims that the design will use a third less fuel than the competing Freedom class, but the Congressional Budget Office found that fuel would account for 18 percent or less of the total lifetime cost of Freedom. The lack of bridge wings on the Independence class had been noted as the top problem in the entire LCS program to the extent that these will need to be retrofitted onto existing ships. The lightweight aluminum construction of the Independence-class ships makes them more vulnerable to damage than the Freedom-class ships. The first ships of both LCS classes were delivered before the designs were mature so that improvements could be built into future ships. The Navy is improving the Independence-class with bridge wings for safety and replacing the 5.1-metre (17 ft) Rigid Hull Inflatable Boat (RHIB) with a 7-metre (23 ft) boat. An improved cathodic protection system will enhance corrosion protection. Like the Freedom-class, the Independence vessels will be getting axial flow water jets which pushes water parallel to the shaft of the impeller to improve efficiency and reduce maintenance; they will also be upgraded to handle the horsepower provided by the gas turbine propulsion system. A winch control system will modulate the motion of the anchor to reduce the reliance on manual hand brakes. The mission bay side door will be redesigned for reliability and the platform lift elevator reconfigured to better handle weapons and ordnance. The Independence class carries a default armament for self-defense, and command and control. However, unlike traditional fighting ships with fixed armament such as guns and missiles, tailored mission modules can be configured for one mission package at a time. Modules may consist of manned aircraft, unmanned vehicles, off-board sensors, or mission-manning detachments. The interior volume and payload is greater than some destroyers and is sufficient to serve as a high-speed transport and maneuver platform. The mission bay is 15,200 square feet (1,410 m2), and takes up most of the deck below the hangar and flight deck. With 11,000 cubic metres (390,000 cu ft) of payload volume, it was designed with enough payload and volume to carry out one mission with a separate mission module in reserve, allowing the ship to do multiple missions without having to be refitted. One Mobicon Flexible Container Handling System is carried on each ship in order to move mission containers. In addition to cargo or container-sized mission modules, the bay can carry four lanes of multiple Strykers, armored Humvees, and their associated troops. An elevator allows air transport of packages the size of a 20-foot-long (6.1 m) shipping container that can be moved into the mission bay while at sea. A side access ramp allows for vehicle roll-on/roll-off loading to a dock and allows the ship to transport the Expeditionary Fighting Vehicle. The Raytheon SeaRAM missile defense system is installed on the hangar roof. The SeaRAM combines the sensors of the Phalanx 1B close-in weapon system with an 11-missile launcher for the RIM-116 Rolling Airframe Missile, creating an autonomous system. The Independence-class ships also have an integrated LOS Mast, Sea Giraffe 3D Radar and SeaStar Safire FLIR. Northrop Grumman has demonstrated sensor fusion of on and off-board systems in the Integrated Combat Management System (ICMS) used on the LCS. The vessels have an Interior Communications Center that can be curtained off from the rest of bridge instead of the heavily protected Combat Information Center found on other Navy warships. Side and forward surfaces are angled for reduced radar profile. The Fleet-class unmanned surface vessel is designed for operations from Independence-class ships. The flight deck, 1,030 m2 (11,100 sq ft), can support the operation of two SH-60 Seahawk helicopters, multiple unmanned aerial vehicles, or one CH-53 Sea Stallion helicopter. H-60 series helicopters provide airlift, rescue, anti-submarine, radar picket and anti-ship capabilities with torpedoes and missiles. DARPA's Tactically Exploited Reconnaissance Node (TERN) program aims to build a Medium-altitude long-endurance unmanned aerial vehicle (MALE UAV) that can operate from LCS-2 and can carry a payload of 600 pounds (270 kg) out to an operational radius of 600–900 nautical miles (1,100–1,700 km). First flight of a TERN demonstrator is expected in 2017. The trimaran hull will allow flight operations up to sea state 5. Austal USA vice president Craig Hooper has responded to critics of the class's light armament by suggesting that the ships employ long range drones instead. The control system for this class is provided by General Dynamics Advanced Information Systems through an open architecture computing infrastructure (OPEN CI), while Lockheed provides their own control system for their variant of the LCS. OPEN CI includes the information technology (IT) infrastructure for the combat and seaframe control systems. This IT infrastructure also includes the primary operator interface for the control and monitoring of mission module operations. 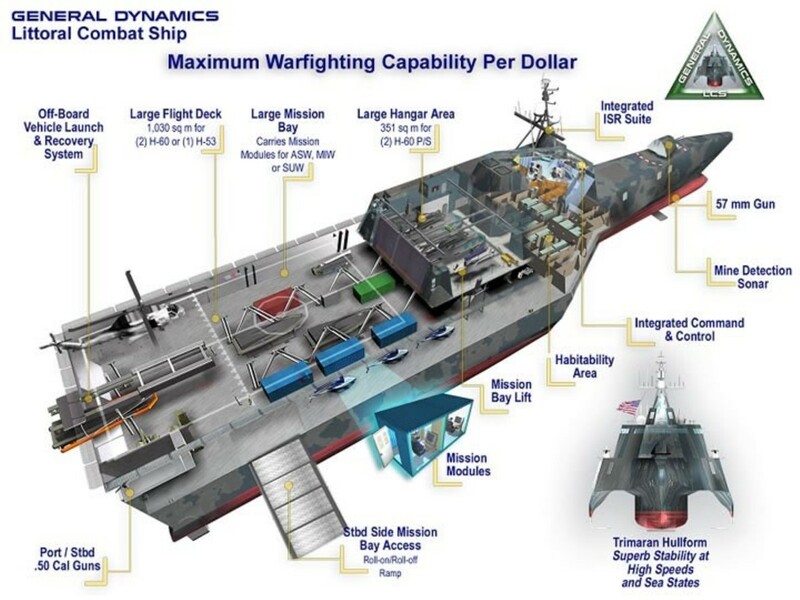 The General Dynamics OPEN CI is also used on the Spearhead-class Joint High Speed Vessel, also built by Austal.